In general, it seems dogs are more accepting of unfamiliar women than unfamiliar men. But why? It might be tempting to think it’s because the dog has had bad experiences with men. And while that may be true in some cases, often there’s a more prosaic reason for it! It’s simply that men “tend” to be more cumbersome and intrusive with their dog-greeting than women! (Sorry guys). Clearly not all men are like this! But men do tend to stride over confidently to an unfamiliar dog, then bend over and give the dog a firm pet. This can be scarrrry for a creature that is often less than half the size of the ‘giant’ man! By contrast, women are usually smaller, gentler and more tentative in how they approach dogs. Dogs pick up on these differences! How can you make it easier for the dog? Ask the man to give your dog space and time to take things in. A slow, gentle approach. Watch your dog’s body language – if your dog looks uncomfortable, don’t let the man get any closer just now. Wait till your dog is ready. Ask the man not to stare at your dog! 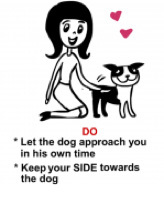 Suggest the man approaches your dog at a slight angle, side on (rather than head-on). Ask the man to make himself less imposing by kneeling down beside your dog to say hello (rather than bending over your dog). Ask the man to speak in a quieter voice.  You may notice some dogs will actually move back slightly if a person approaches them head on. Help your dog by giving him the choice about whether to greet (or not). Let your dog choose when to greet people, rather than be ‘forced’ to accept petting from a stranger. Watch how dogs manage ‘space’. ‘Space taking’ and ‘space giving’ is a subtle but important part of dog-dog communication. In my experience, it’s rarely mentioned but it can make a HUGE difference to how comfortable your dog feels.